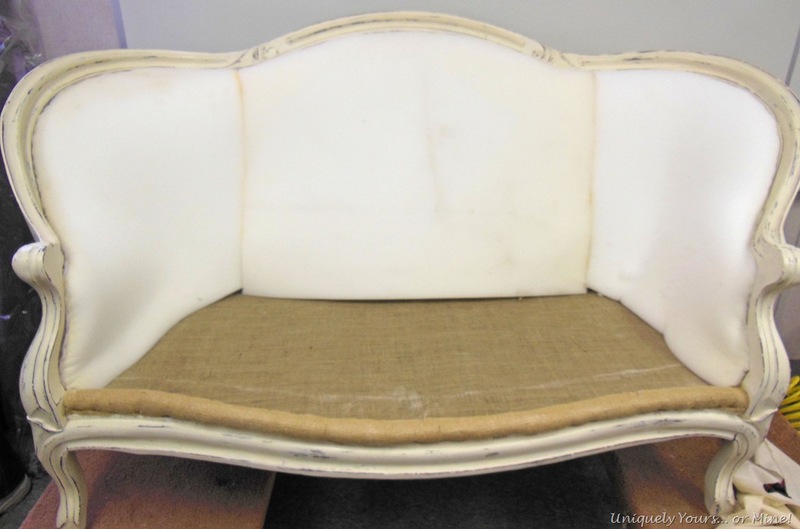 How to Upholster a Settee – Uniquely Yours… or Mine! She was perfect (remember I said that), she had great lines (and lucky me) already had all of the fabric and innards removed… big time upholstery project here I come! First things first, I cleaned her up and painted her with 2 coats of Old White Annie Sloan Chalk paint, lightly distressed, waxed and buffed her really good. Then off to class she went! 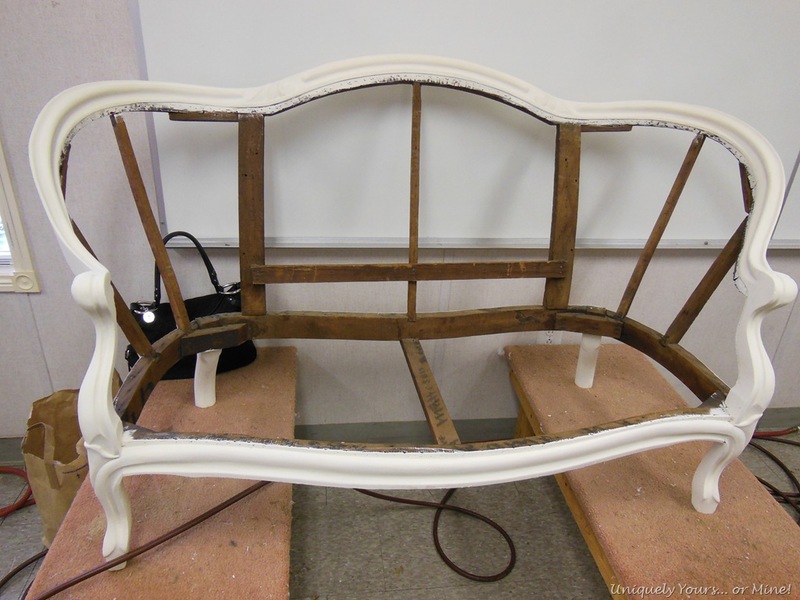 Class was every Tuesday from 12-3 for 12 weeks, it took 10 weeks for me to get this settee reupholstered! While I know that sounds like a lot, there is a lot of waiting for the instructor as there were 9 other students in the class who also needed his attention. So I’ll walk through the steps with you below, for most of them I have pictures (not saying they are good ones, but they are pictures) some of them I either was too frustrated to take out my camera or there was one day I totally forgot it… sorry Now for those of you who could care less about how I did it just mosey on down to the bottom of the post to see the “After” glamour shots… but for the very few of you who may need some of this information read on! 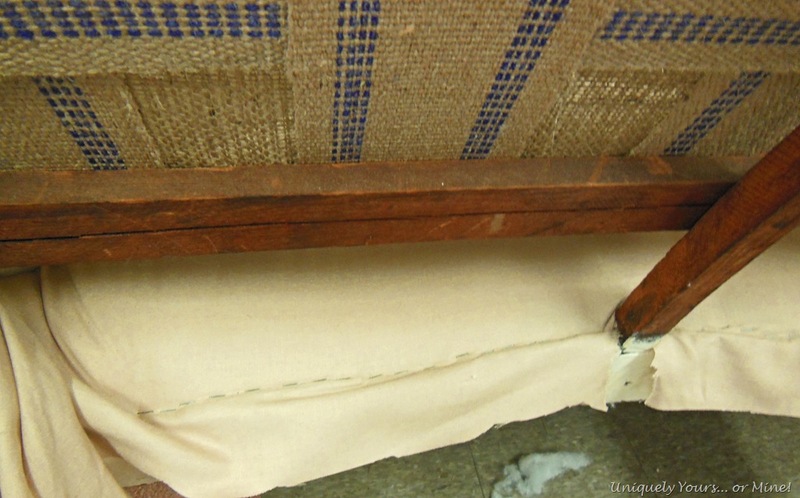 Install the burlap webbing using a webbing stretcher and stapling it down. 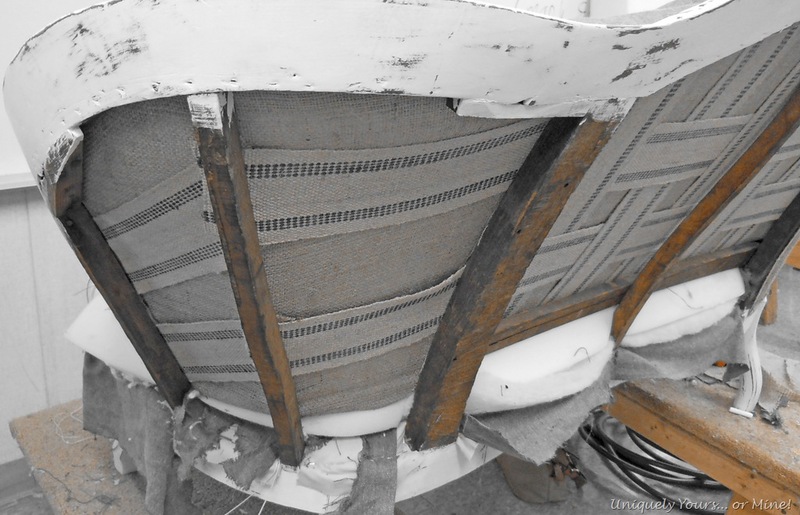 The straps were spaced about 2” apart and when installing the horizontal webbing weave it through the vertical pieces. Install burlap over all of the webbing, pull taught, folding it over at the edge and staple it down. 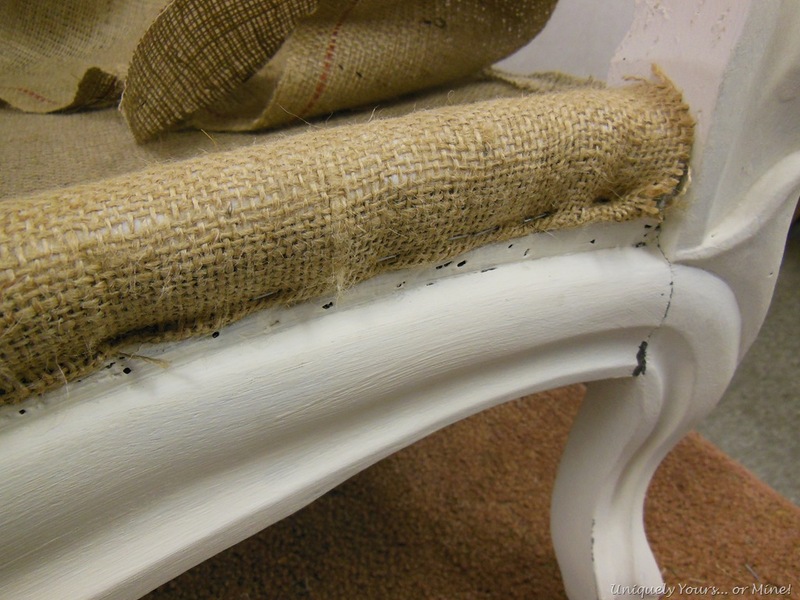 Settee seat burlap photo up close. 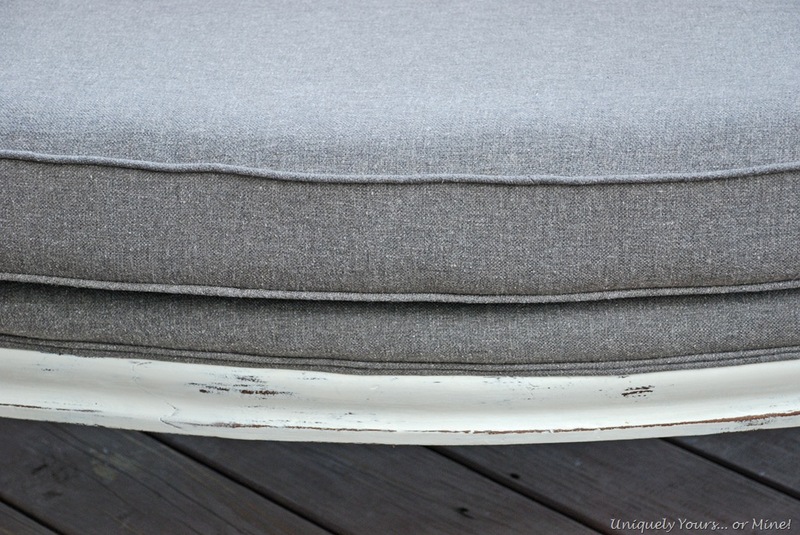 Install the roll edging, this is installed to help cushion the edge of the wood when you sit. The roll edging is made this way, just trim it to size and staple it along the top front edge. 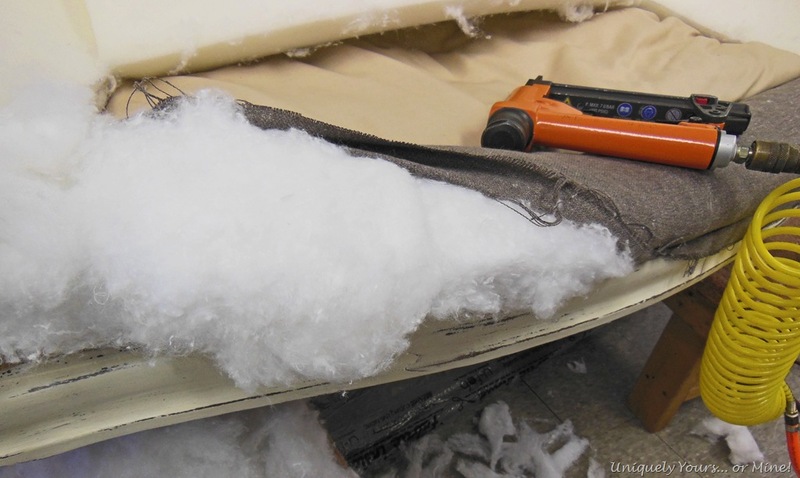 Cut to size and install foam. The instructor had me cut it into 3 pieces them glue it back together, not sure why, but I did it. Staple the foam down at the top edge so you get a nice “roll / pillow” along the edges. 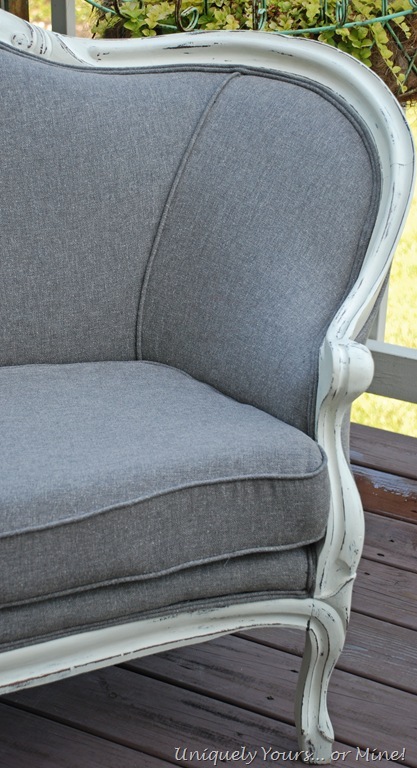 Cut out your decking (fabric that is under the cushion) material. Sew your fabric (about 4” for mine) and the decking fabric together. Lay the fabric upside down along the line (drawn to 4” from front frame) and with a curved needle sew it to the burlap, big stiches here folks. Lay layers of cotton batting under both parts of the decking, pull the front part of the decking taught and staple to the front frame. Now you have a beautiful deck! I had never done this before so I was really proud of myself at this point! Bring the back part of the decking through to the back side, cut fabric around supports, pull taught and staple to frame. Now for the back fabric… let me tell you this almost was the DEATH of me… more an alignment issue than difficulty. Layout your fabric, three pieces cut intentionally to allow the fabric to be placed appropriately, pin the fabric pieces along the area where you want your piping / seam to be. Finding the EXACT same spot on each side to center… those suckers were a huge pain! Sew the panels and piping together and install on the back stapling along the top edge first. Hint: put in “place” staples in strategic areas to make sure you have it lined up properly then work your way from the middle place staple to the edge etc. Once the top is stapled pull the bottom through the back, cut where necessary for structural supports, pull taught and staple along the back edge. Doesn’t it look good so far? Install batting (not cotton) all along the back of the settee a few staples to hold it in place is all that is necessary. Layout the 3 pieces for the back fabric, lay and pin them like you did up front. Sew the 3 pieces together, no piping this time. 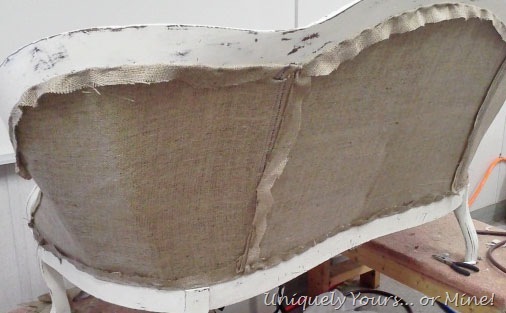 Attach the fabric to the back of the settee with staples (using place staples etc.) and pulling taught. Once trimmed it looked like this! I felt like a freakin’ champion at this point! After trimming the excess fabric, attach with hot glue some of the miles of double welt piping you made (oh, did I not mention I needed to make a crap ton of double welt, well I DID! )Careful here, the hot glue will burn your fingerprints right off your fingers! The piping will go along all of the edges where you stapled, front and back… it’s a lot, take your time, don’t get any glue on the fabric! 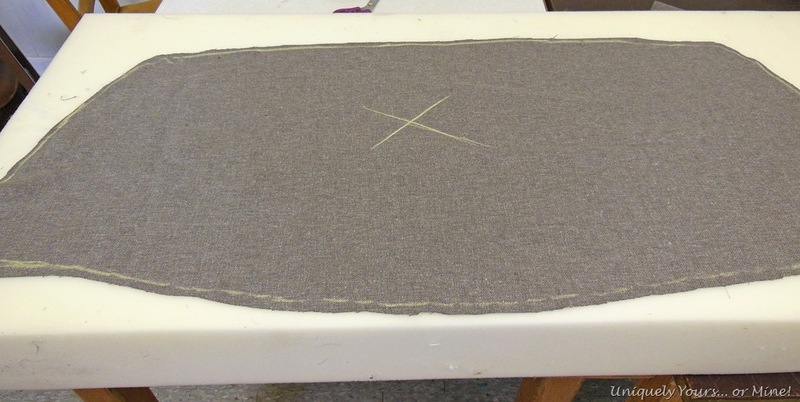 Cut out your fabric for your seat cushion (we are basically making a box cushion with curves). Layout fabric on the foam (mine is 5”) and trace. 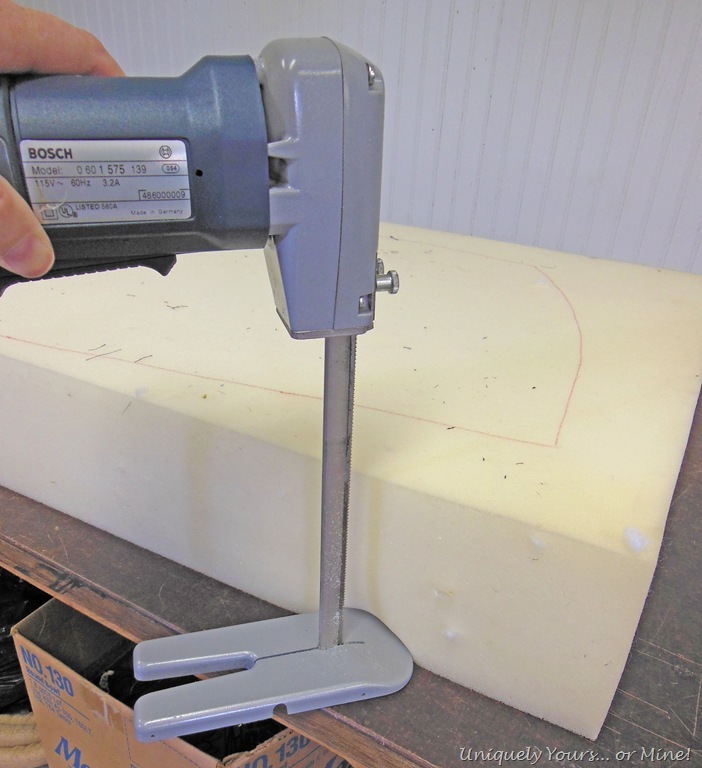 Using this handy dandy foam cutter cut out your pattern. Hint: If you’re at home use your carving knife! Yes! The foam fits! We made the box cushion (sorry no tutorial for that, easy to find one one on the web) with a 4”edge so that the cushion fits in it snuggly. Here she is in all her glory! I’m THRILLED with how she turned out! It’s super comfy and a great neutral gray color! My “mad” double welt making skills are now a force to be reckoned with! The back is just perfection! The hardest area for me were these corners, which I am happy to say came out great! 1. 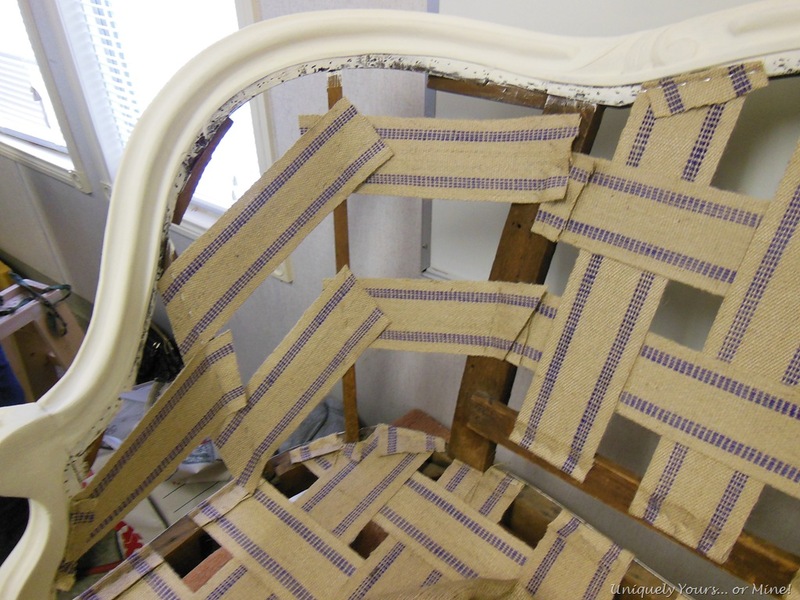 This upholstery stuff is HARD work and takes lots of time… which is why it is not cheap! 2. 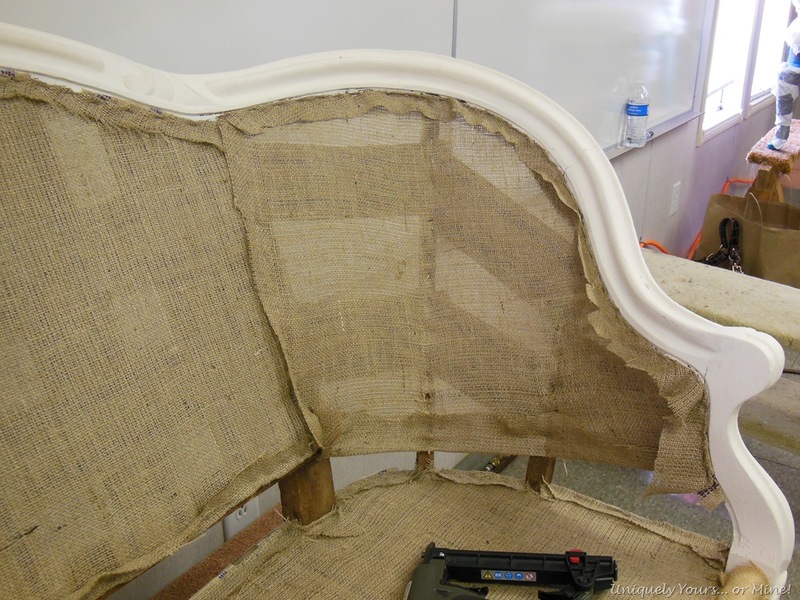 I suggest you take a class and learn how to do this the “right” way if you are interested in doing your own upholstery… but maybe you can figure it out by watching YouTube videos… not me, I needed a teacher for sure! 3. Just because the fabric has been removed from a piece don’t get too excited… this process would have been SOOOO much easier if I had the original fabric to use as a template. Keep that in mind! Next Post: Now Showing at Orange! That is such an awesome settee! Perfectly neutral without being boring. I’ve been toying with the idea of reupholstering a chair i inherited from my grandmother, but I’ve been a bit scared to tackle to project. The class sounds like a good idea though. Do you mind sharing where you took yours? Thanks Jennifer! I took my classes at the Adult Education center here in Henrico Co. (Va), they have them in other counties too. The settee came out great! I wish i could take upholstery classes, but there are none where I live. Keep going to your classes and you will soon be doing custom work. Very talented. Thanks Patty! I really don’t care for the upholstery work, so I know I won’t be going “pro” in it, but I do love doing a piece here and there! 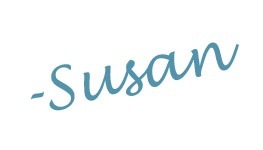 Susan, You did an excellent job with a lot of perseverance, I’ll bet, on your part. The settee is awesome. Good for you girl. Thanks Kathy! It was a lot of work, but I love the end results! Oh yummy! I have a chair I’m going to attempt to reupholster…I’m pulling out the big guns though…My Mom!! She’s done a gazillion pieces over the years. You did an awesome job! Great job Susan! No classes where I live so I’m depending on you for more info. I had a hard time understanding the decking application – and why did you use cotton fill instead of a batting under the decking? By chance did you learn anything you can share about using the squiggly wire stuff in lieu of (or maybe with) the webbing? Did you make a paper pattern for the fabric covering? How do you make the double welt? And last – where did you get your upholstery supplies and equipment? Again, well done! Thanks CJ! I did use cotton batting, not fill on the decking, not sure why it looks like fill to you. I have not installed the metal springs before, but my teacher recommended the webbing because I was going to use a loose cushion. I started making the double welt using a tutorial on lone, but ended up finding a better way for me, I have a double welt foot for my machine so that helped. I will do a tutorial soon, but there are lots of good ones out there. Lastly I bought my supplies locally at Foam to Size, a no frills upholstery supply store, there are many online as well! Thank for all the answers Susan. Can I ask one more thing? What kind of tools do you need for a project like that? CJ, I used a pneumatic staple gun, webbing stretcher, pliers, glue gun, sewing machine, scissors and a foam cutter. Hope that helps! You are amazing. I can’t even imagine doing that. What a beautiful job you did. I’ve never even thought of attempting such a huge project. It’s truly beautiful! Oh my, your settee is just gorgeous Susan! You did an amazing job. I can see you leaned a lot in your class. But I think I’ll leave the upholstery projects to the expects. That looks daunting to me! Thanks Sharon! I always wanted to learn so now I k ow how hard it is! Fantastic! I gotta save this one, may need to rethink the position that I cant reupholster! Thank you for sharing. Thanks Darcy! My suggestion to you is start on something small so you won’t get frustrated and give up, good luck! beautiful work!!! now I know why it costs a fortune to have something re-uphostered! Thanks Pam! Now I know why it’s so expensive too! It looked even better in person! I hope it found a good home. I want to learn how to do it, but just reading your tutorial makes tired. You did a great job! Thanks Deb, you’re funny! It’s still in my home, but it will find a home I hope! Just stunning! 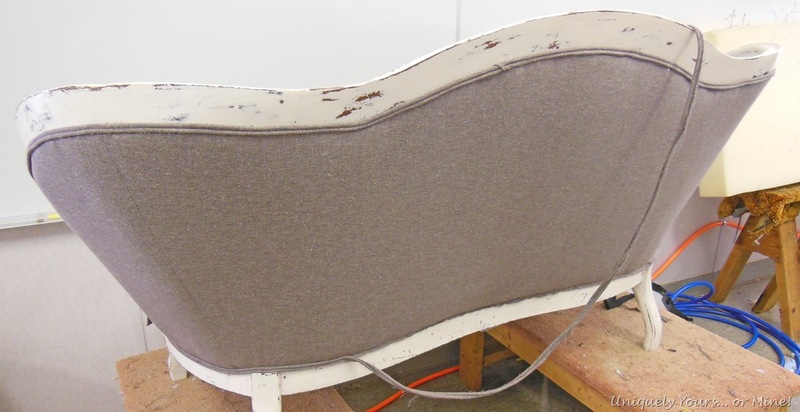 I love it and I know how much hard work goes into upholstery projects. Good for you! Thanks so much, it was certainly a labor of love! That’s so sweet Molly! It was a lot of work, but so worth it to me! Beautiful, it looks wonderful, love the color. Great job! Thanks Jeannie! I’m glad I tackled the project, I certainly learned a lot! Be happy cuz you sure helped me! The whole time I read this I was thinking upholstery is worth the price now that I see what’s involved. I’m just trying to make a cushion so your tips will really help. thanks for sharing this tutorial. Thanks you! Good luck to you on your cushion! Holy smokes, this is beautiful! Thanks Marty, it was challenging, but I loved learning! Hope to see you soon and Happy 4th!! WOW! You are so talented! The settee came out amazing! And I love your fabric choice. Your settee is gorgeous! Thanks for sharing some details. I would really love to find an upholstery class in my area. I, too, am a furniture hoarder. So glad we can admit it. LOL I’ve reupholstered lots of chairs but want to get brave, like you, and try a sofa. Thanks Kim! This really was a challenging task, but I’m glad I had a teacher there to show me the right way to do it. I hope you find a class in your area! I’m super impressed. I used to “upholster” furniture for theatre productions, but that meant no one was looking too closely. I’ve always wanted to upholster something for my home, but never had the courage. I’m going to do it! Thanks for the inspiration. Thanks CJ! It’s tedious and very detailed but I am happier now that I know how to do it! Good luck! 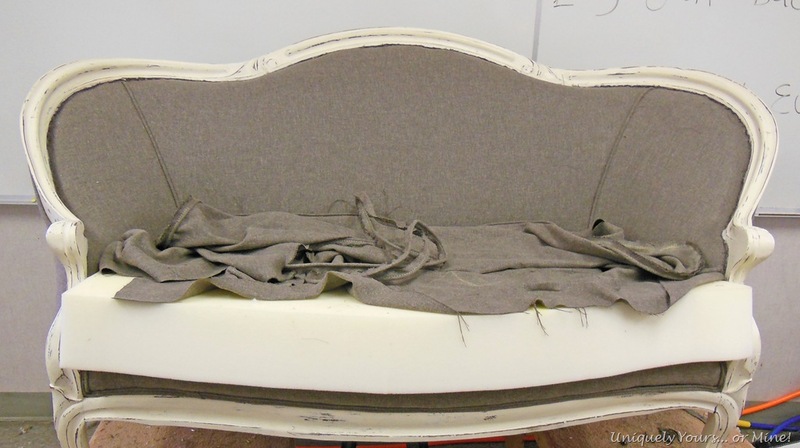 I want you to know that not only is this settee beautifully done, but so is your tutorial. I have a chair that is now naked and needs the back and seat upholstered. I have done this process before but not with a naked piece like yours. This has helped me a great deal since I was unsure of the beginnings with the webbing and burlap. Appreciate it a great deal! So gorgeous! What a great tutorial too. 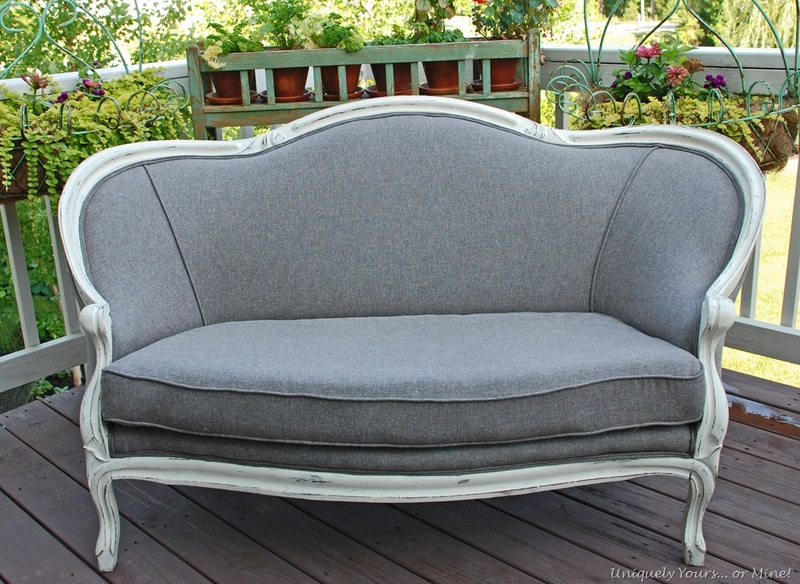 I’m featuring your settee in the PoPP Spotlight this week. Thanks for linking up. oh my gosh, this is fabulous, love the color too. 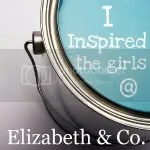 I’d love for you to come link up at Be Inspired this next Thursday morning. I’m pinning this!! Thanks Debra, I’ll certainly stop by! Wow you are amazingly talented! Thanks for sharing such a detailed tutorial. I love it!! Thanks Megan, I hope it helps someone! Thanks Patti it was a labor of love for sure! 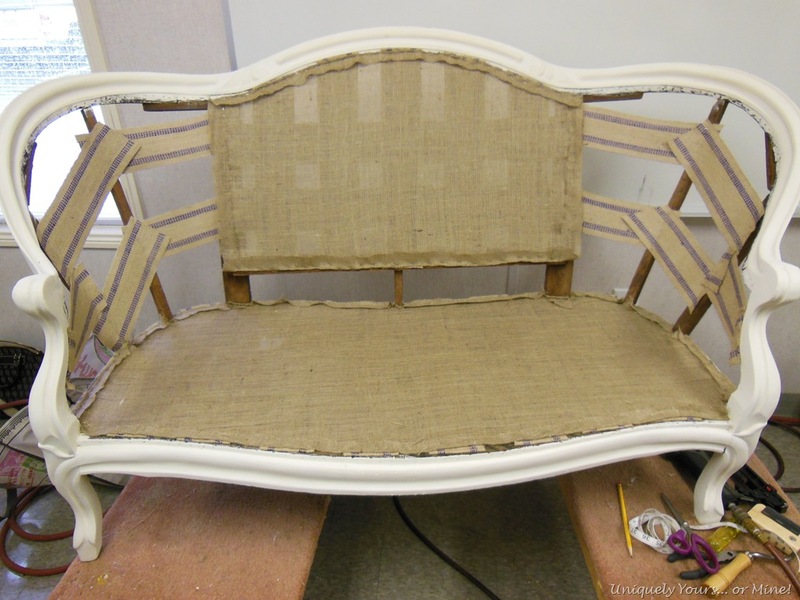 this is great..I have a settee that has to be redone and this gives me some confidence that I can do it! pinned it…. What a job!!! It just looks gorgeous! I have my grandmothers settee that is just like yours and is upholstered in it’s original velvet and I just look at it and throw up my hands, lol. I think I’ll find a class like you did so when I freak out I have someone to talk me down! I wish I could help, but I bought it at a local fabric store, U-Fab in Richmond, Va, and I just picked it for its feel and strength. I knew better than to get a print as that would have been VERY difficult to use with all of the curves etc. keep that in mind when you are looking for your fabric. Be sure it’s sturdy but has a good feel. Good luck and take our time! 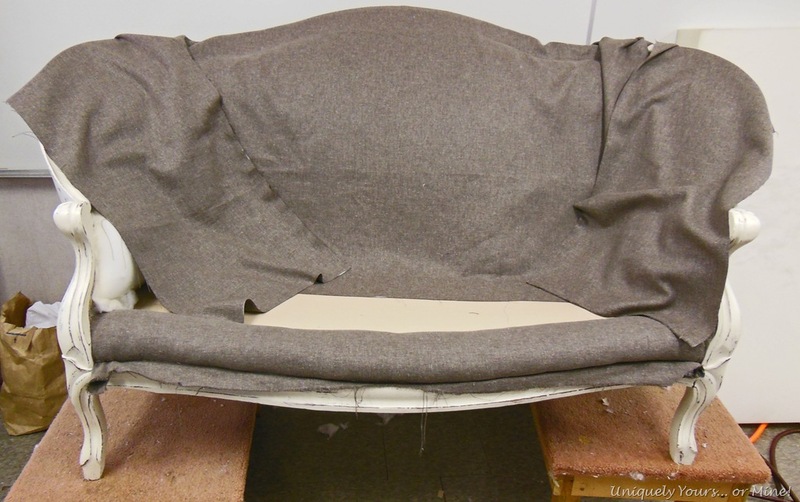 I’m in the process of recovering an old settee myself, and I must say, your tutorial has been the most helpful!! 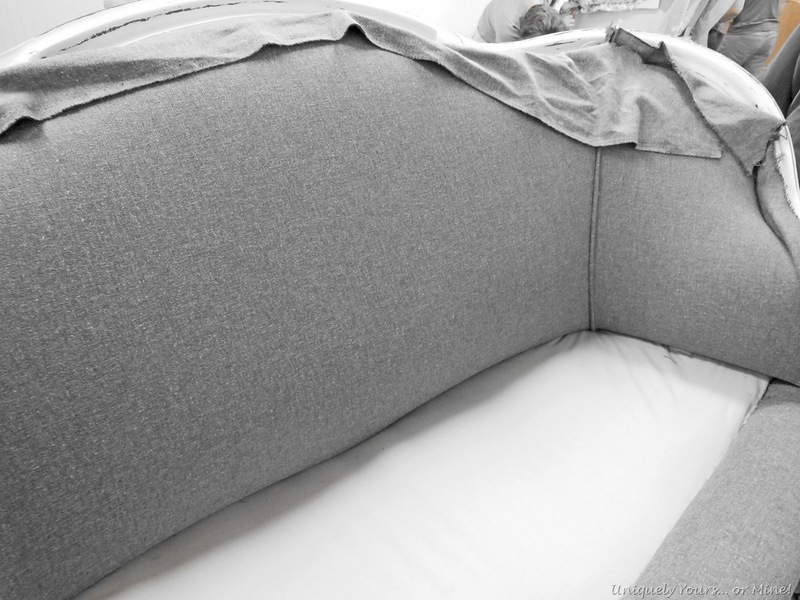 Quick question for you, on the foam you used for the back of the settee; how did you measure it to fit the curves? Also, mine had metal webbing and springs so I just repaired as need, however, I’m stuck on how to fill the bottom. Have you had an experience recovering something with springs? Anyways, your peice is lovely, and you are so right; even though I had to pull all of the old fabric off–having the pattern of the old fabric is SUPER helpful. Any suggestions welcome! Thanks for your post! I’m so glad the tutorial has helped Jessica! To mark the foam to fit the curves I cut the foam to fit it square then laid the foam on the back and marked the foam with a marker following the curves. While I didn’t have springs there were others in my class who did. I know they put burlap over the springs then the foam. I hope this helps you! 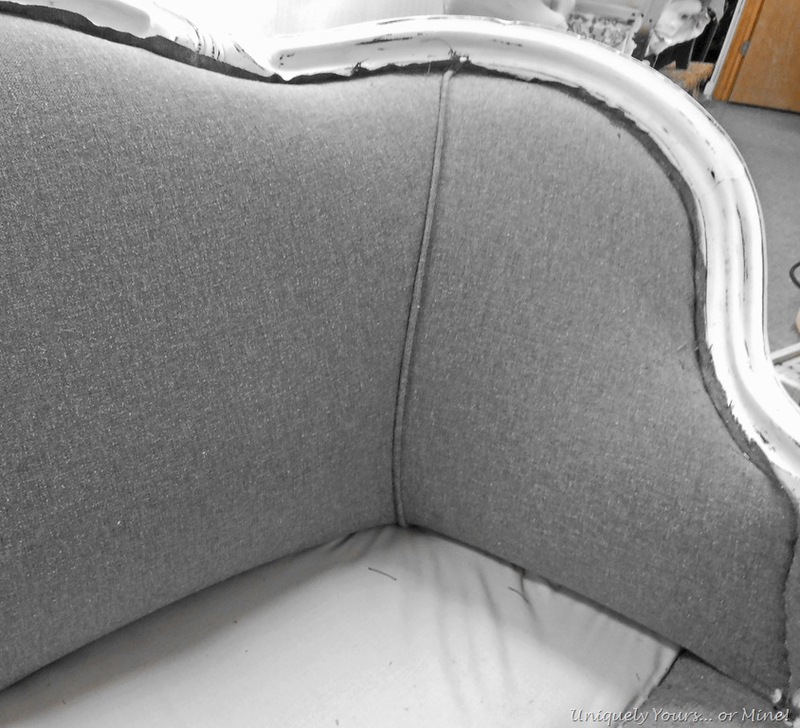 I am in the process of upholstering a French settee. I made a pattern or template using Bristol board and then used that to cut the foam. Since moving here just over a year ago I have yet to find a great place to find pieces. There are a couple of auction houses that seem good and I’ve also seen some good pieces at the Peddlers Malls. As always Craig’s List is a good resource. I took my class in Richmond, VA so I can’t help you with that recommendation there. I hope you find some good places, if so let me know! 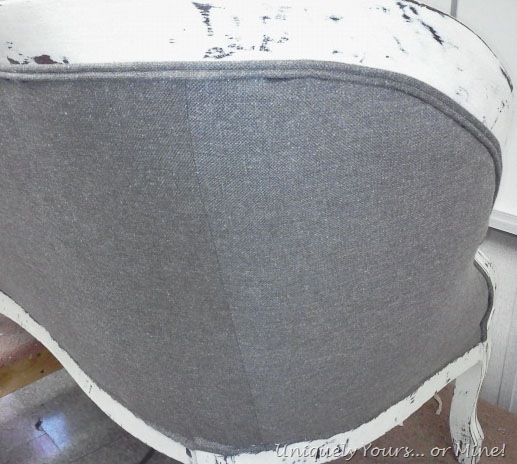 Hi Susan, I used this excellent blog post to reupholster a piece I did that was quite similar to yours. I appreciate your tutorial and I hope you do not mind me referencing your tutorial on my site! Oh My Goodness! I can not tell you how happy I was to find this. I have had a settee sitting in my garage to recover for 2 years. Now I can finally get it done. Well I’m glad I can help! I hope you get yours done! This makeover is truly amazing! 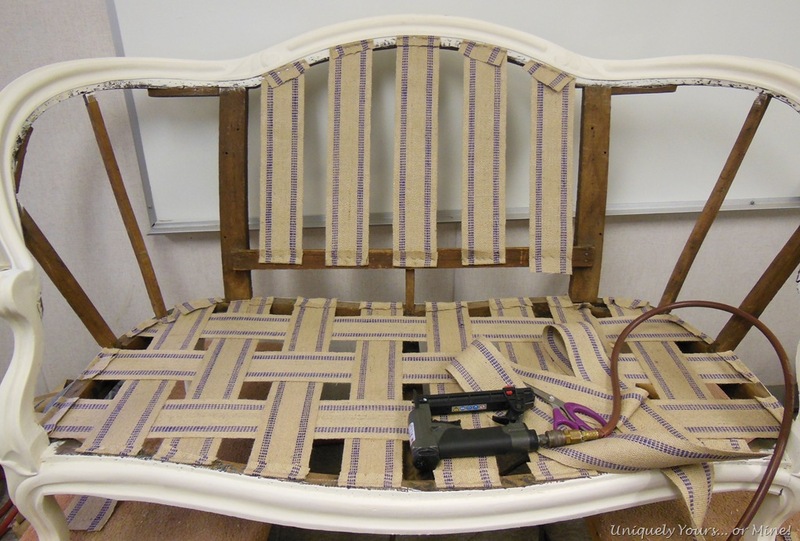 I just reupholstered some cane chairs and I thought that I was pretty good, until I saw this tutorial….wow you are awesome! 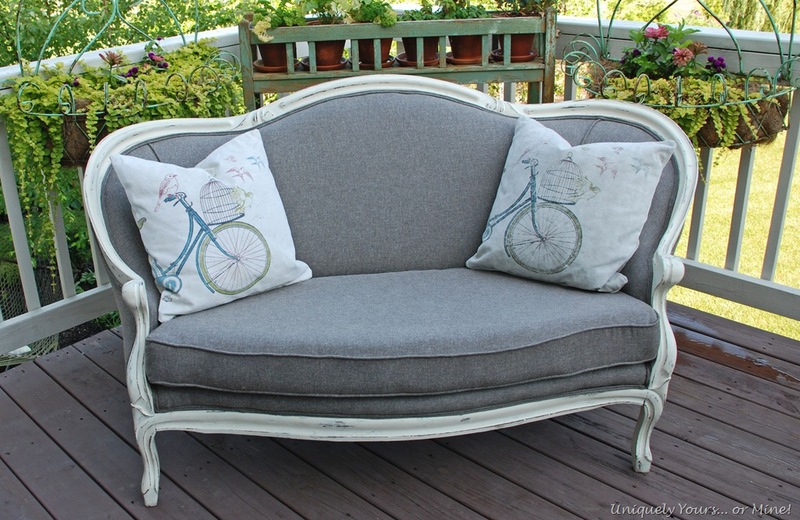 I am considering purchasing a little french settee as my next project but I am super intimidated with all the sewing involved. I am pinning this tutorial for future reference. Thanks! Oh it was not fun doing the upholstery, but necessary! Thanks so much for your kind words and good luck with your settee! I hope my instructions help! Such a great jobb and I consider myself as a fan of you and your dream occupation which I dream for myself someday. I started with small projects and recycling some old lamp shades and old vases ,really joyfull and environment friendly. Thanks so much Denise, it certainly was a labor of love and I’m not sure if I’d do it again, but you never know! So glad I found this tutorial and you did a GREAT job! 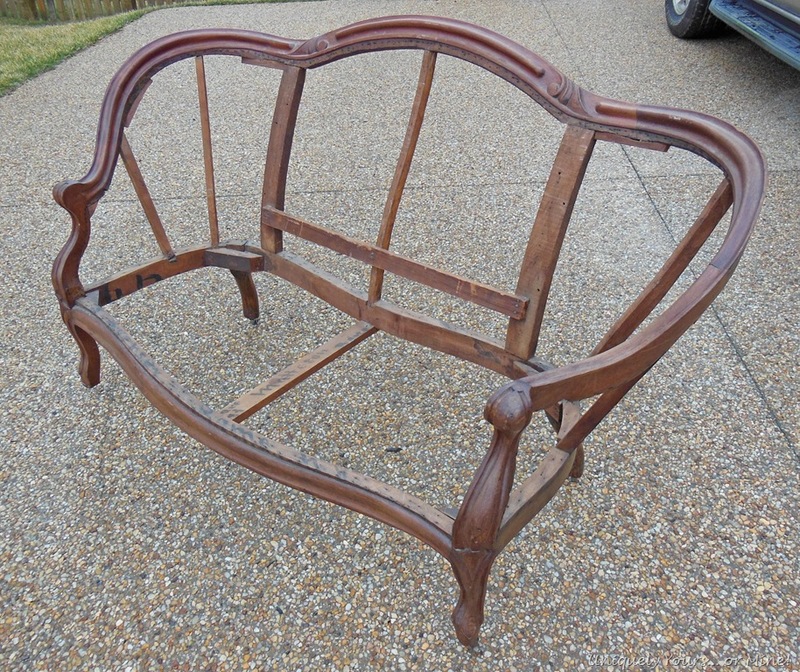 I have similar frame I had stripped by my upholsterer who was going to only charge me $400 to redo. Unfortunately he retired before I could find that perfect fabric. Now, thanks to you, I’m confident I can tackle this myself. It’s a big project but you can do it too! Thanks for stopping by Sharon! Thank you for posting this. It has been very helpful. I love to reupholster but have never taken a class. I guess I learn by doing and making mistakes!!! You’ve motivated me to take a class to learn how to do it right! Thank you!!! Oh you’ll love taking a class, so helpful to learn how to do it right! That couch looks amazing! 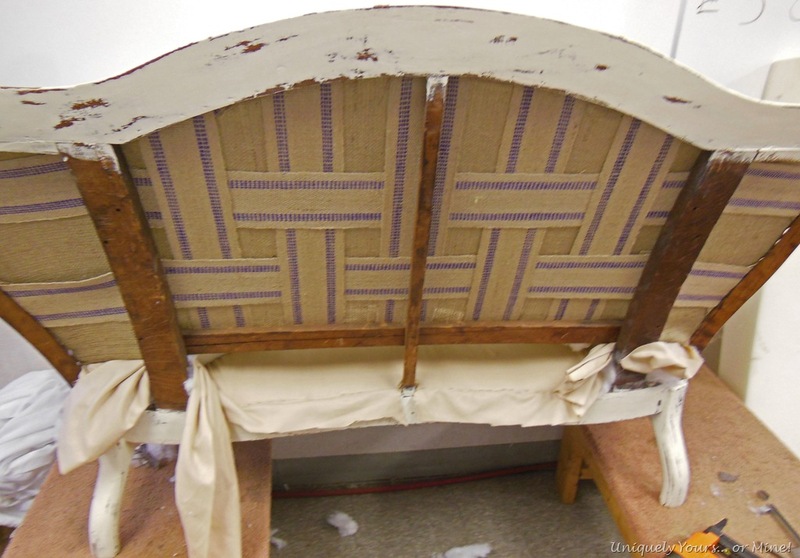 I never knew that so much goes into reupholstering furniture. 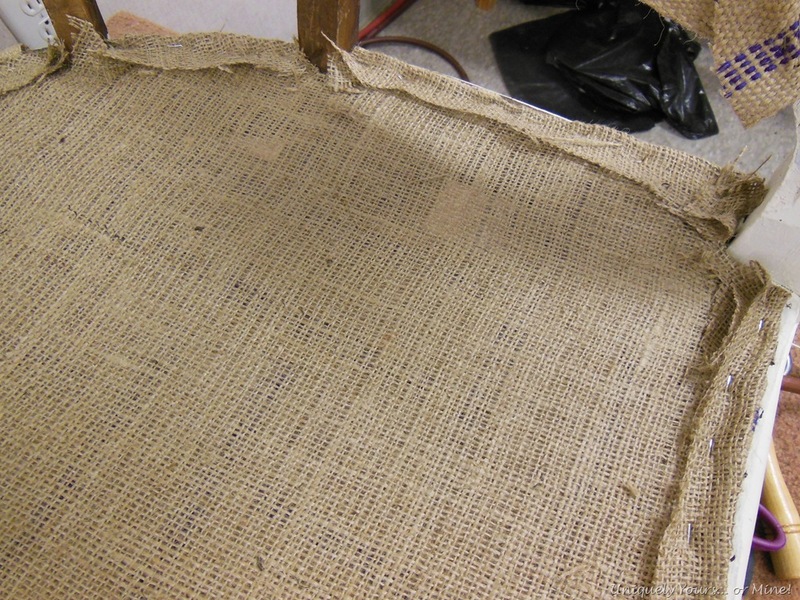 The most interesting pictures you posted were from the first step where you added to burlap webbing. Do all couches have this webbing? It would make sense, it’s just that I’ve never seen this process before! I love it. What a great job. I was at my aunts hose the other day and she has this exact one, with the fabric that is. The wood on the arms is in rough condition from her dog. I am saving this post, she said she might recover hers one day. I just got through doing a chair from the 30’s. I tackled tufting. Wish I could post a picture of my chaur to share Your settee would look great tufted. Wow, very nice you inspire me to take upholstery class. Beautiful work it is gorgeous . Seat height approx. 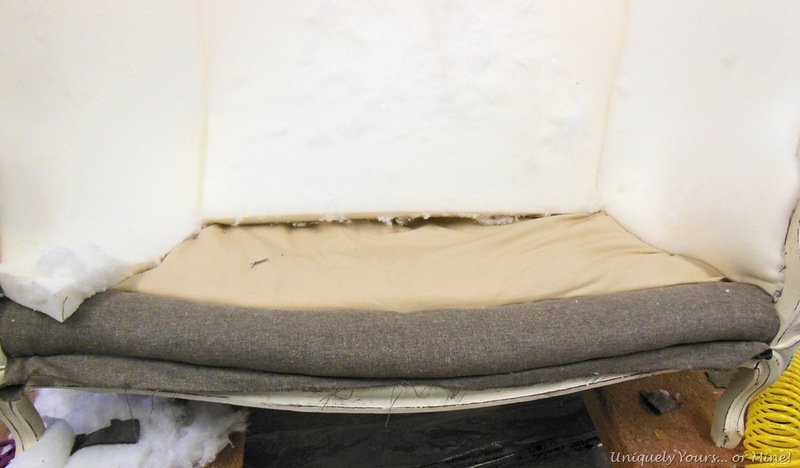 18″ accounting for upholstery. Do you have any idea about how much I would need for that? Thank you for taking the time to document such a detailed turtorial. It’s helped me know where to start with my own little project. So glad I could help a little bit! Good luck on your project Sarah! Beautiful job, Susan! How many layers of cotton batting did you use? Thanks Paulette! I used one layer of batting. Thanks for the quick reply, Susan! You said in step 6 “Lay layers of cotton batting under both parts of the decking”. That’s “layers”, plural. So I assume you mean one layer each for both parts. Is that correct? Sorry to be a pain! So my settee is painted, supplies are delivered and there it all sits! I have a couple more questions. Is it really necessary to use a decking fabric? Or could you just use all one fabric? I guess that depends on whether or not sewing the decking fabric to the burlap is necessary…. 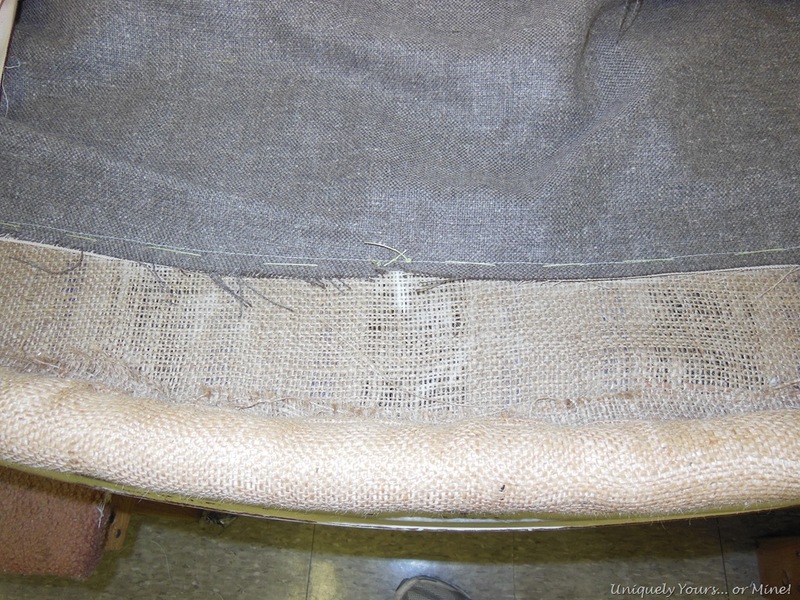 Also in step 3 the photo shows the roll edging wrapped in burlap. Did it come that way or how did that happen? Thanks, again, Susan! Lord you are testing my memory for sure! You can use any fabric you want for the decking, but usually the decking fabric is cheaper and it was smooth, I think you can use a good tight weave fabric and be ok. The rolled edging I wrapped in the burlap and stapled on both sides. Hope this helps!